I've been a photographer since six, a writer since 12 and a poet since birth. Santa brought me that camera...don't tell me there isn't a Santa! I love this stuff...let's make magic happen. Anyone can take a photograph. Push a button. Snap. It is the seeing, not the taking that predominates my thinking and creative process, my thoughts and inspiration, and it is what directs my use of images and words to enhance my goal of sharing with others what I see: ultimately, each gaze shows me beauty. I utilize all five senses to enhance my ability to see. Light is my mistress. I return again and again to be satisfied by light’s ability to reveal discoveries, answer curiosities and tantalize my senses’ roles in creating images and words. While my equipment and technique may be described as simple, my process of listening and interacting to explore that which, or who, inspires me is sophisticated and nuanced. When photographing a person, I strive to celebrate, honor and respect the individual and all humanity which the person represents in the moment. My intention, by process and tone, is to have others choose to reveal themselves to me intellectually, emotionally and physically. This may be for a moment or for hours. When photographing a woman, I reach into an even deeper well spring of inspiration. As Kahlil Gibran wrote for the main character in his book “The Prophet,” “A little while, a moment of rest upon the wind, and another woman will bear me.” Each photographic experience produces rest, inspiration and motivation to create more. Each enables my creative rebirth, time and again. My work inspires my presentations and writings, and vice versa. Sometimes I convey my words to paper, and sometimes onto the woman who inspired them; some are directed to presentations or poetry, and some to books. In the silence of the image are two voices: She says, “show me who you see in me,” and I say “let this be part of your voice.” Most women and I get connected at a time when they seek some sort of visual measure of who they are. Call it serendipity. The place where she reveals herself can best be described as Sacred Ground, and there I create based on who I see as I have listened. As with people, much of the environment’s appeal to me is the imperfectly perfect beauty that comes naturally. The concept of wabi-sabi weaves through my vision as I see beauty in textures, lines, context and contrasts whether the environment is flora and fauna, or simply the surroundings in which I find myself in the moment of inspiration. This philosophy espouses beauty is "imperfect, impermanent, and incomplete." The transience can be measured in seconds, days, years or decades. In all strangers and friends, I seek in the moment the chance to reveal who I see with respect, integrity and insight. The transient nature of beauty can be seen here, too: expressions, movement, and touches accentuate features, reveal feelings, convey stories. Essentially, I believe that the human experience involves and conveys beauty at all moments. It is the seeing, not the taking, that reveals it to others. 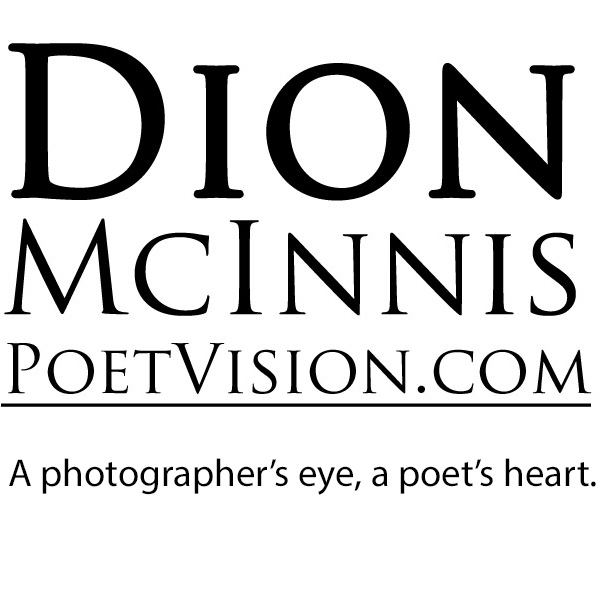 Owner of Dion McInnis Photography (1977-1994), freelance business providing commercial, portrait, public relations and fine art work in the Houston area. Currently providing fine art and commissions. Photojournalist and writer for weekly suburban newspaper 1978-1982 (Advertizer Advocate, now out of business); won national award for series on special education in Fort Bend Independent School District. Freelance writer for various publications, including two national photography magazines—The Rangefinder and Studio Photography. Fine art photographer, public speaker and author since 2001. Serves as portfolio judge, critiques images for Houston Photographic Society, teaches photography and has organized photography exhibitions. Photos exhibited in four one-man shows, held in archives of City of Houston library (“Alief Faces”), and shown in several juried competitions. Currently teaches at Houston Center for Photography. Also, one of the founding reviewers of Houston Photography Study Group. Also, reviewer/judge for Houston Photochrome Club's annual banquet 2012. Reviewer/judge for Ft. Bend County's Celebrate the Arts photo exhibition. Member Houston Center for Photography and Texas Photographic Society (board member). Served on the board as president of The Arts Alliance Center at Clear Lake; a founding reviewer for the Houston Photography Study Group. Cited as “Man Who Champions Women” by New Mexico Woman Magazine for his work; also, received Bay Area Turning Point shelter’s “Caring Heart” volunteer award. Photography instructor at Artcamp, held at University of West Bohemia in Pilsen, Czech Republic in 2010, 2011 and 2012. Held presentations for the community through University of Houston-Clear Lake on the teaching experiences: "Art Removes Borders," and "Art Changes Lenses." Regular presenter at photography organizations, including Houston Photography Study Group, Houston Photographic Society, NW Houston Photo Club, League City Photo Meetup, Woodlands Photo Club and more. Published fiction and nonfiction; prolific with essays, stories and poetry. “Best Fiction” award in 2002 Bayousphere literary journal. “Listen to Life: Wisdom in Life’s Stories” published by Xlibris in December 2005 based on Dion’s weekly newsletter by same name. Previously wrote for two national photography magazines: The Rangefinder and Studio Photography. Recently published four photography books: “The Seeing, Not the Taking: A guide to seeing for photographers,” and “Show Me Who You See in Me: Close, closer, closest,” which displays a series of portraits of women. Also, "Literary and Visual Metaphors" with Laszlo Perlaky (photography) and my poetry in response to his images. “Daddin’: The Verb of Being a Dad,” a collection of stories, journal entries and poetry celebrating the moments of living the verbs of being a father and son. Cited in media internationally on parenting, morale boosting, creativity, expression, writing and more. Completed 50 Years, Faces, Stories as part of Clear Lake Area Chamber of Commerce's 50th anniversary. Project involves interviews, photographs and profiles of 50 people who helped make the Clear Lake area what it is today.